You know it’s been a bad week when you get an over-draft notice from your bank, then discover your account has been ‘hacked’. That’s exactly what happened to our daughter, last week. Apparently, someone has been using her debit card number. They had such a good time spending the money, they drained her checking account of about $600 within a week! You know it’s been a bad week when you go to the bank to file a dispute claim, concerning your stolen funds, and the bank employee makes YOU do all of the necessary calling and letter writing! True story, this happened to our daughter, last week. You know it’s been a bad week when your buyer defaults on the sale of your house, just 5 days before the closing is scheduled. That’s exactly what happened to our son, Brad, and his wife, Jennifer, last week. Not only did they receive the disappointing news, last week, they received the bad news on the day of their 4th wedding anniversary! Now, that’s what I call a “double whammy”. Apparently, it took the potential buyers over a month to discover they couldn’t consolidate their student loans! You know it’s been a bad week when you discover water dripping from the ceiling of your dining room. Your week gets worse when that leak continues to grow very large, in a short amount of time, and you have laminate flooring underneath it! That’s what happened to our daughter, on Saturday afternoon, when she discovered the air conditioner drain pan (located in the attic) had developed a hole in it. You know it’s been a bad week when you’re taking a Saturday nap, and your daughter wakes you up saying, “I need some help.” The week grows worse when the necessary “help” involves climbing into a very warm attic, in the middle of a hot afternoon. You know it’s been a bad week when the air conditioner repairman informs you he’ll “have to order a new drain pan, and it won’t be here until Monday afternoon.” Thank goodness for that spare a/c unit in the window, but it still means sleeping on a mattress in the living room floor for a couple of nights! You know it’s going to be a bad week when you wake up and start having ‘spasms’ in your leg again, after three weeks of not having any at all… Alas, my old ‘friend’, sciatica, has returned with a vengence! I guess it’s safe to say that the Prednisone has completely worn off. There are still three more [long] weeks until I can meet with the neurologist. Sigh. So, how’s your week going? Summer is ‘officially’ here, even though the temperatures of the past two weeks have made it seem to have arrived early! Yesterday was the first break we’ve had in our unseasonably high temps, but they’re predicted to be high again today 😦 So, I’m going to “cool my heels” by joining in The Hodgepodge! 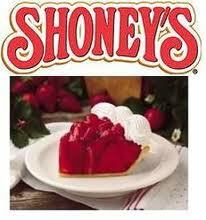 As always, thanks to our gracious hostess, Joyce, for continuing to host this fun meme, especially now! 1. June 23rd is National Pink Day. What’s your favorite something pink? My favorite ‘something pink’ could be any one of three things… the pink, hand-painted, ceramic ‘what not’ that a friend made for me after I gave birth to my daughter (36 years ago), a pink sleeveless top that I like to wear in summer, or the pink (mauve) chair I recently borrowed from Ed’s mom’s house (to sit in after my back trouble began). The smell of roses always reminds me of a funeral home, but I love them anyway. That’s a tough question, and it really depends on what day it is! Most days I prefer reading over writing, but I do enjoy blogging a lot! 5. Sam Keen is quoted as saying, ‘Deep summer is when laziness finds respectability.’ Would you agree? Is laziness ever respectable? How will you be lazy this summer? Yes, I agree. I think everyone needs a chance to relax, sometimes, and I don’t really consider it being lazy. I consider it resting my body and soul. My laziest days are spent lounging under my favorite oak tree on St. Simon’s Island, or under the Magnolia tree in our front yard, sometimes with a book or magazine, but always with someone else to talk to! 6. The Florida Keys, Disney World, or a resort somewhere on the Gulf Coast…which Florida destination would you choose (and why) if the trip were today? Today, I think I’d choose a resort on the Gulf Coast, simply because it would be a little closer than traveling all the way down to the Florida Keys… I could use a little more beach therapy, right about now. Thankfully, the gardening season of 2015 is almost at a close. It’s been a difficult growing and harvesting season, for a number of reasons–first too much rain, then not enough rain, then not enough garden helpers! (Ed had to hoe and harvest alone, this year.) 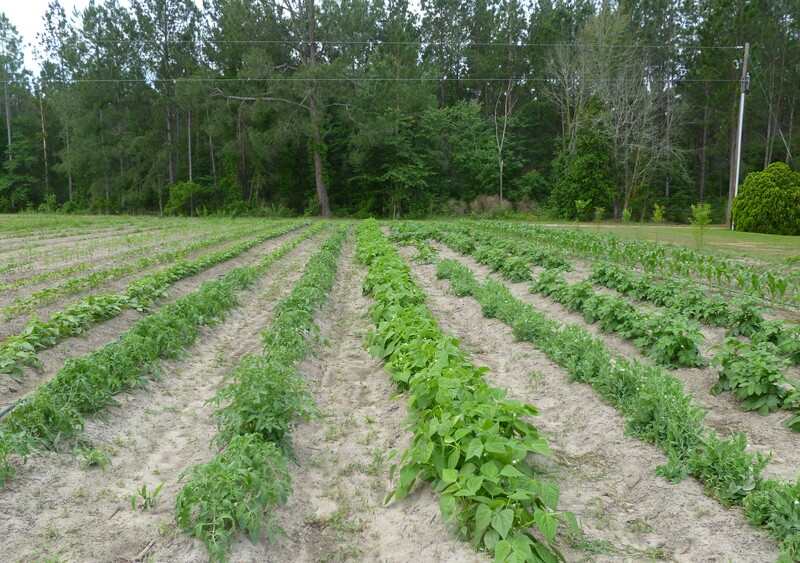 By last Sunday, Ed’s back was beginning to give out, too… We put up the last of our peas and corn, this week. In spite of all of our troubles, we managed to can enough food to last until next year, and probably a little beyond. Praise the Lord! We still have to ‘can’ our tomatoes, but, after that, we’ll be finished. 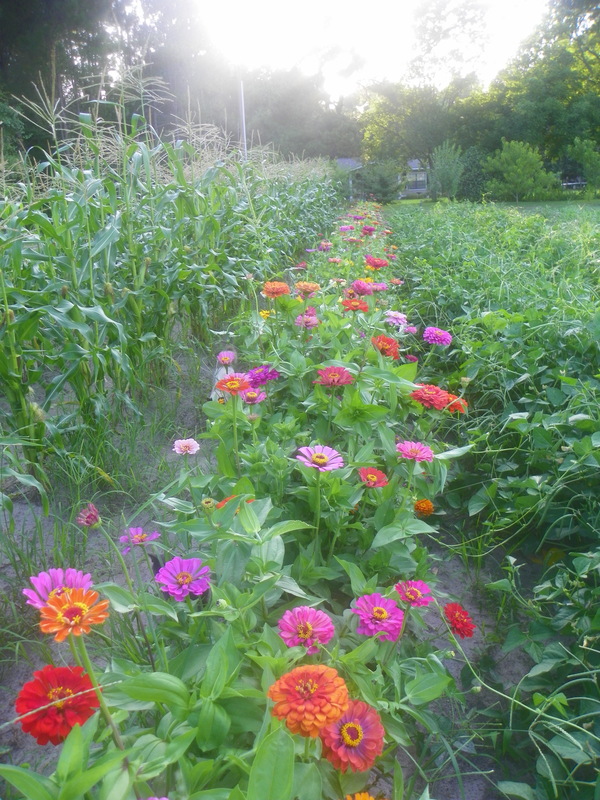 Hopefully, I can still enjoy the row of beautiful zinnias and sunflowers, in the garden, for a while longer. 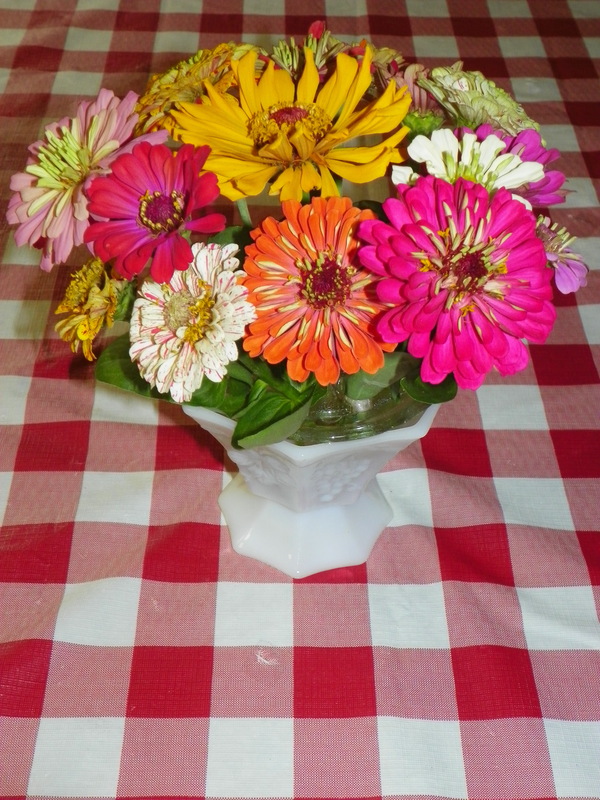 I love having fresh bouquets of flowers to enjoy, each day! Wow! 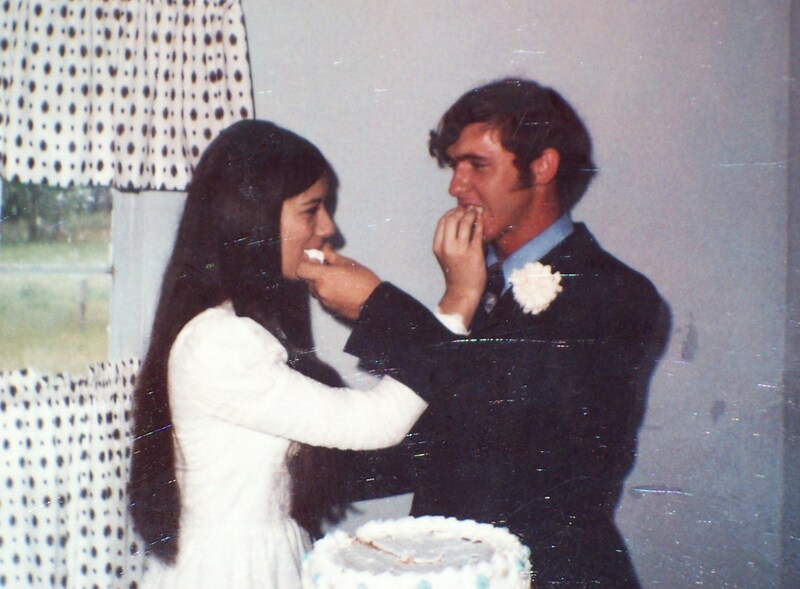 Has it really already been four days since Ed and I celebrated our 43rd anniversary? I guess time flies when you’re having fun… Actually, time flies when you’re not having fun, too. I can testify to that, after too many days spent canning vegetables! Ed and I woke up early on our anniversary, June 18. We both knew the garden would just have to be put on hold for the day, because it was our day to celebrate! We exchanged our cards and gifts, then decided, at the last minute, we’d pack up and head to the beach, after all. 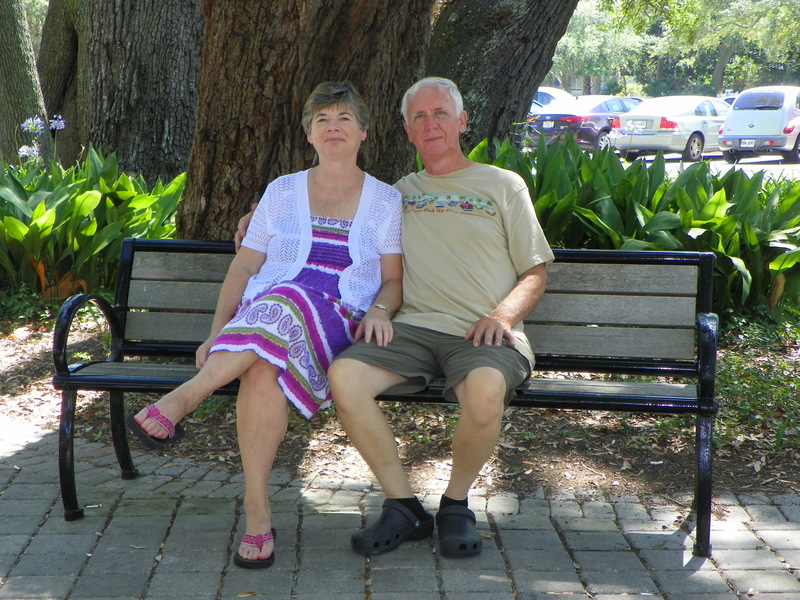 Upon arriving on the island, the first thing we noticed was another [older] couple sitting under our favorite tree! Oh, no! We’ve made dozens of visits to SSI, and we’d never encountered this problem before. Fortunately, the tree is large, so we picked a spot to the far left of the couple and set out our chairs. As it happened, the couple left just about an hour after we arrived, and we had the tree all to ourselves for the rest of our visit. Ed and I took our camera and tripod with us, and did our traditional anniversary photo session, too. 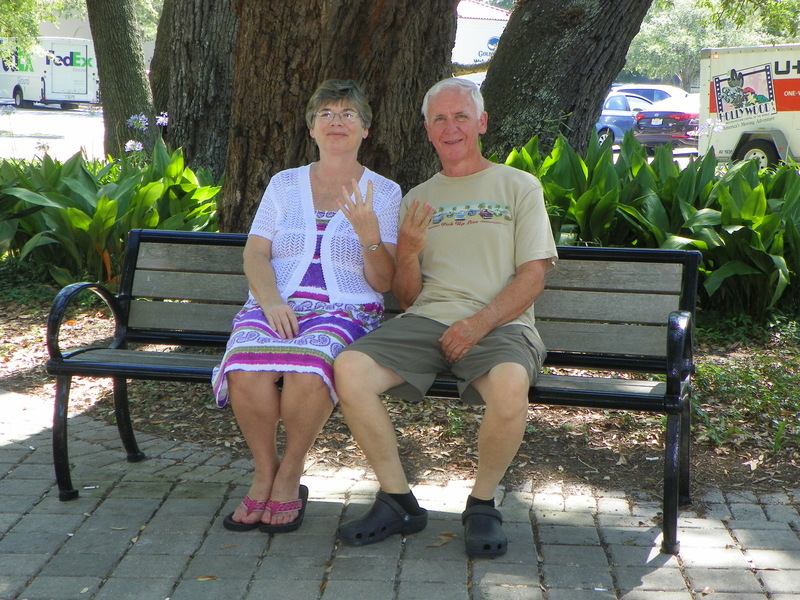 (A tradition we started, about five years ago, was holding up fingers to show how many years of marriage we’re celebrating) We took our anniversary pictures in the park, on the same bench we used last year. After the first three or four pictures, we discovered the camera lens had fogged up, so we had to start all over, once the lens cleared. At one point, two men came driving up in a golf cart, and stopped short, just seconds before driving through one of our pictures in progress! We laughed. Believe it or not, we eventually got some good shots! We ate Southern Soul Bar-be-que sandwiches for lunch, and, as usual, they were delicious. If you ever visit St. Simon’s Island (near Brunswick, Ga.), and are a fan of bar-be-que, I highly recommend Southern Soul! The place isn’t much to look at (it’s a converted gas station), but the food is so good! Temperatures reached 101 degrees, after lunch, but a nice ocean breeze was blowing, most of the time, so it didn’t feel that hot–until we left The Village! The ride home was pretty warm. Thank goodness for car air conditioning–and, believe me, it was working overtime, that day! 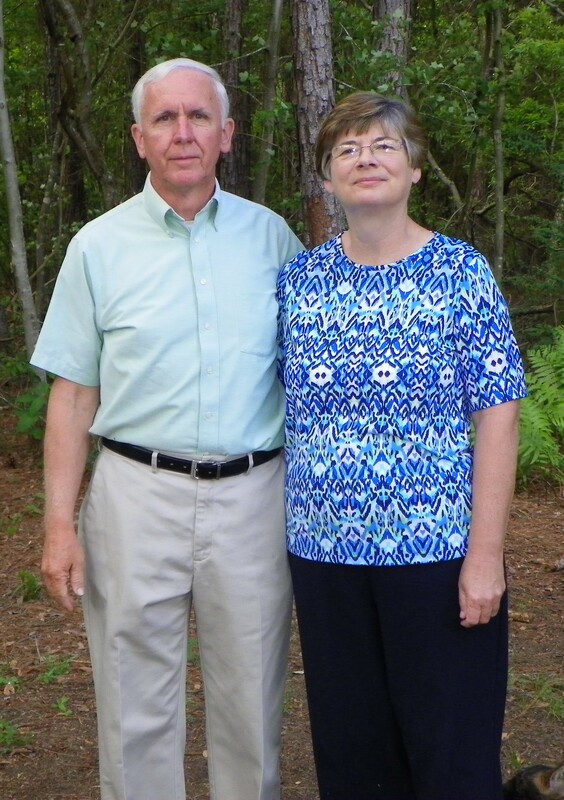 Of course, our anniversary would not have been complete without our traditional meal at Kentucky Fried Chicken, so we stopped in Jesup, for an early supper, on the way home. Us and one more couple were the only ones in the entire place, so it was a quiet and pleasant meal. Ed remarked, “This (the chicken) is almost as good as it was 43 years ago!” We didn’t get our meal for free, like we did on our wedding night, but we did get the senior citizen’s discount 🙂 Sometimes, growing older has its privileges. Ha! We made it home, safe and sound, with no car problems, which is always a good thing! My back even cooperated and didn’t give me too much trouble during the ride. It was an awesome day, at an awesome place, spent with an awesome guy. I couldn’t have asked for more. It’s been a while since I’ve devoted any time to “Photographs and Memories”, but I think it’s a post that’s long overdue. They say “every picture tells a story”, and I do believe that’s true. I know most of our old family photos do, anyway. It’s fun to look back at old photos and remember how things used to be. I hope my readers won’t mind accompanying me on a little walk down memory lane today. This picture was taken of Ed not long after our first child, Brandy, was born. I still called him “Edward”, back then, and just look at all of that brown hair on his head! This picture was probably taken in the late fall. If you look closely, in the background, you can see the remainders of harvested cornstalks, still out in the field. Eventually, we completely enclosed our mobile home, so that it looked just like a house. It was a process that would take us about thirteen years to complete. The mobile home section of the house is now gone, totally replaced with new construction in 1991. The “house that Ed built” still stands, today, next-door to where we currently live. Our daughter and her family are living there now. The most interesting thing, to me, about this picture, is the fact that it was taken in what now serves as our oldest son’s back yard! 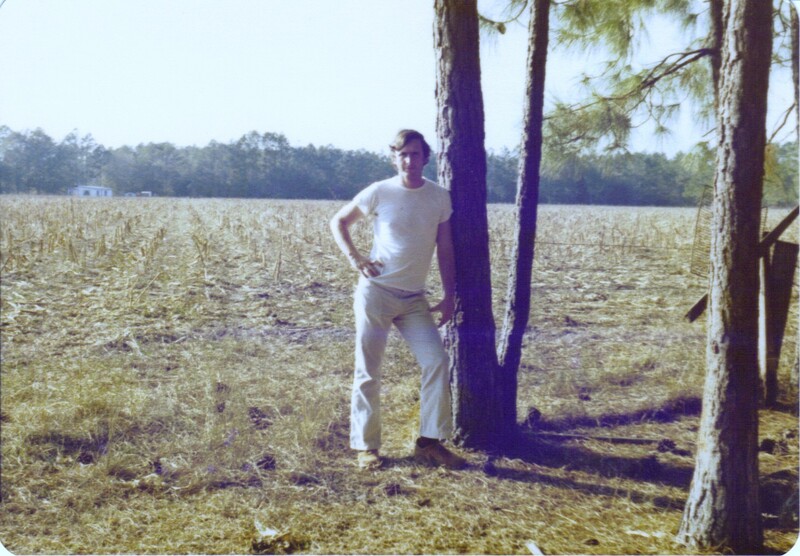 Little did we know, thirty-six years ago, that our son, who had yet to be born, would be living on this very spot of the family farm! Several things come to my attention when I look at this picture. First of all, both of our daddies still had dark hair! 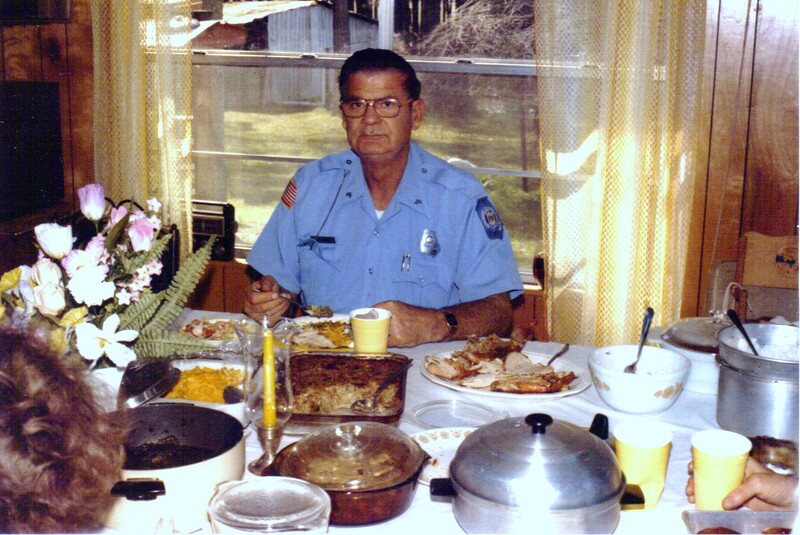 By the time our daughter was born, in 1978, Ed’s daddy’s hair had turned totally gray. He previously used ‘Grecian Formula’, for men, so I had no idea his hair was actually gray! I see that daddy is wearing shorts, and Ed’s daddy is not wearing any shoes! This was usually the case during the summertime. Ed’s daddy rarely wore any shoes around the house, and, often, rolled the legs of his pants up. Ed’s daddy is also wearing, his trademark white t-shirt! The next thing I notice is the grill in the picture. That was the best grill daddy ever owned! He could cook a ton of things on it, at one time, and he used it for years and years. Bar-b-Que chicken was his specialty, and was the meal we had for supper on the night of my first date with Ed! The grill was green, and was made out of heavy-duty metal, much different from what’s being manufactured, today. I still remember having to share the backseat of our little Firebird, with that new grill, on a trip home from Jacksonville, Florida. Last, but not least, is daddy’s car, in the background. 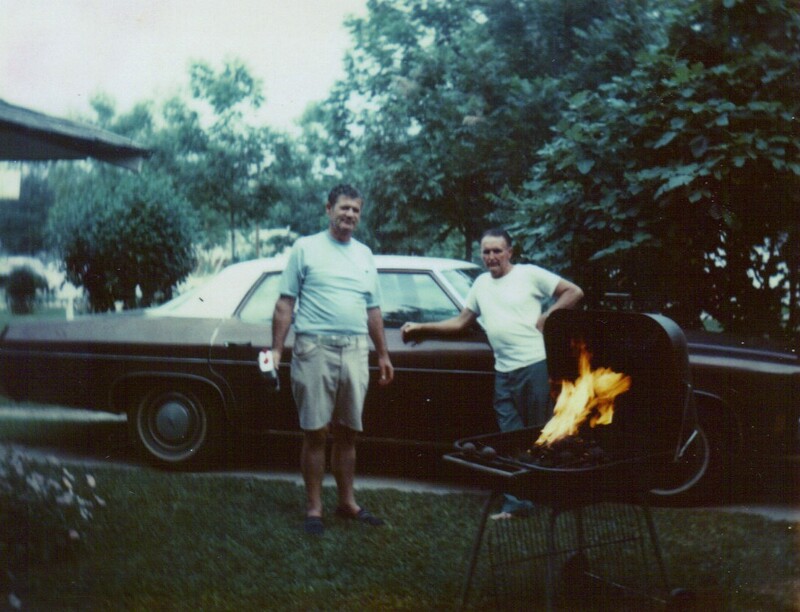 I think this Oldsmobile was one of daddy’s all-time favorite cars. It was the last new car that he purchased. Little did we know that daddy’s beloved Oldsmobile would become the victim of fire, when the storage building/shelter caught on fire, one evening. We never knew, for sure, what started the fire, but it claimed the car before daddy could get it moved to safety. Fortunately, my parents’ house was spared from the fire though. I’m going to flash forward, a bit, and share a picture of the pool and deck that Ed built. 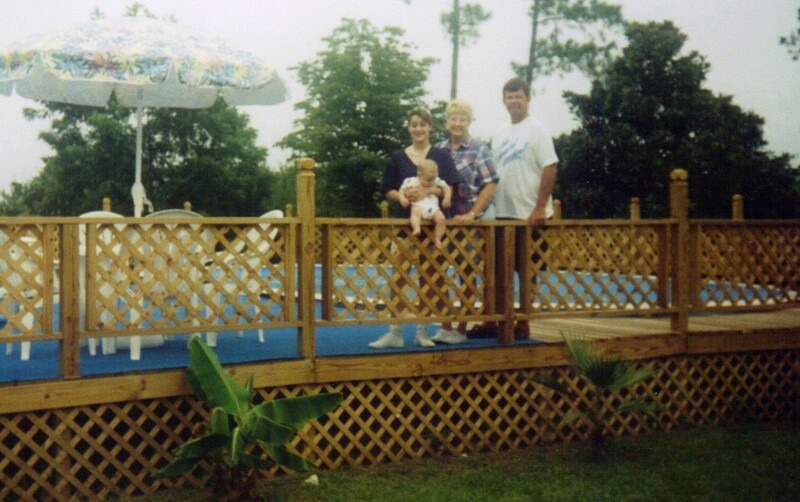 The year was 1995, and that’s my brother and his family posing on our newly completed deck. The baby in the picture is now twenty years old! We bought the above-ground pool at a JC Penney ‘end of the summer’ sale in 1994, for about two thousand dollars. We stored the pool until the spring of 1995, then Ed and a couple of friends set it up in March. It was a huge oval shaped pool, 16 x 32, I think. We bought a special, stretchable, (Doughboy) liner, and dug out one end of the pool, so it would be suitable for diving. Ed built a huge deck along one entire side of the pool, then he built a walkway all the way around it. We put indoor/outdoor carpeting on the large area of the deck. Ed even built a walkway from the pool deck, and joined it to the house. We didn’t even have to get our feet dirty on the way to our pool! We enjoyed the pool and deck for ten years. Eventually, the children all grew up, and we no longer used the pool. Ed took the pool down, and I gave it away to a co-worker. Ed took the deck apart, and got rid of most of it. We’ve used many of the posts and decking boards for other projects, over the past few years. Little did Ed and I know, when this picture was taken, that, one day, we’d build another house on the back side of this deck and be living in it during our retirement! Do you see that Magnolia tree, in the far right of the picture? Little did we know, when we planted it as a shrub, it would furnish shade for us, in our golden years. That tree sits in what is now our front yard, and we sit underneath it, almost daily. Back then, little did we know, indeed! Ed and I began our first real attempt at growing a garden back in 2012. (We’d briefly made one other attempt at gardening, back in the early 80’s, without any success.) Up to that point, we’d had very little interest, and even less knowledge, about growing anything. It didn’t take long before we discovered we were hooked on gardening! Our first garden was moderately successful, especially considering we didn’t have a clue about what we were doing. (Back then, we didn’t have a clue what a squash bug was, or that they could wipe out a crop almost overnight!) We were able to grow more fresh vegetables than we could eat, so we rediscovered the art of ‘canning’, too. Best of all, Ed and I discovered that gardening brought us closer together, as we toiled over the seeds, and watched the tiny emerging plants mature. Finally, we had a hobby that we both enjoyed together! 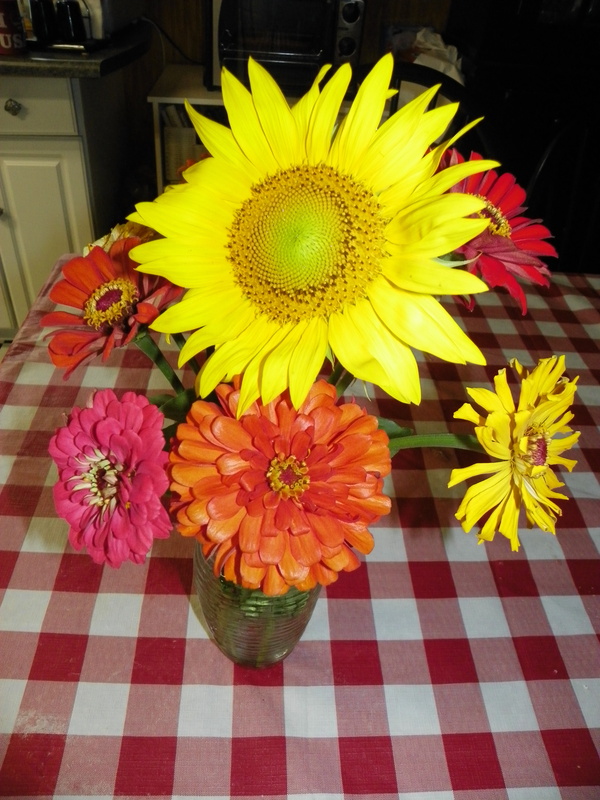 Both 2013 and 2014 brought more gardening success, as we learned a little more with each passing year. We learned that we needed to make our garden rows shorter, so our water hoses would reach all the way to the end. We learned that our rows needed to run vertical instead of horizontal, so we could pull the hoses up and down the rows, instead of across them. 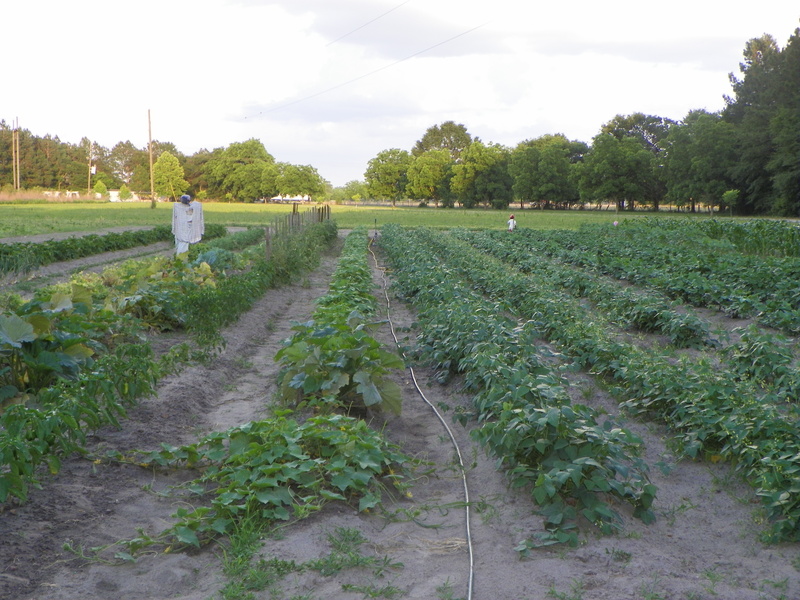 We learned what squash bugs were, and how to get rid of them. We also learned that, sometimes, tomato plants need some calcium added to their soil, or their tomatoes will develop ‘bottom rot’ before they ripen. We learned that onions grow at night, and require lots of water. Best of all, we learned that putting chicken compost into the rows, before planting the corn seeds, makes the corn grow much better! When Ed retired, in January of this year, I was excited that he’d be able to help ‘full-time’ in the garden. I was looking forward to spending lots of mornings and afternoons together, toiling among the plants, and watching them grow. Unfortunately, things didn’t work out quite like I’d planned, this year. Ed and I were able to plant the garden together, then my back flared up the day after we finished planting the last of the seeds. 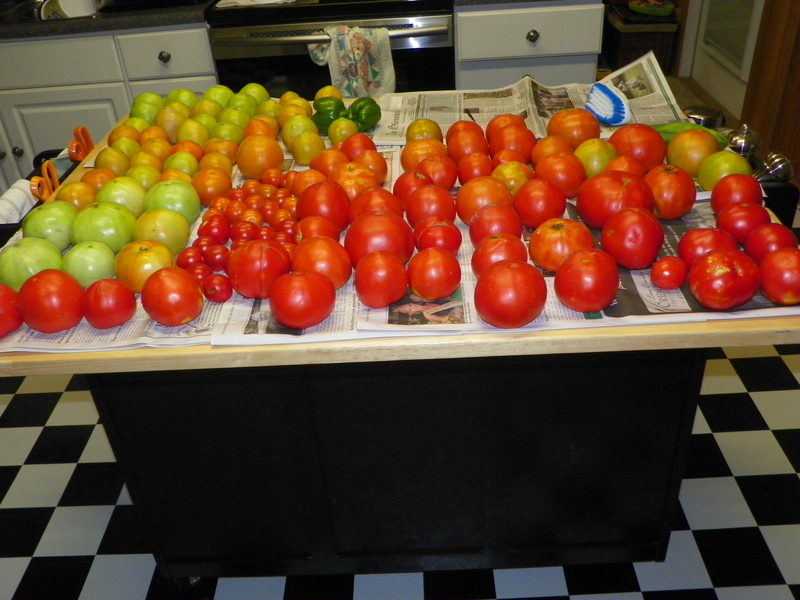 At one point, I wasn’t even able to walk outside to see how the garden was growing. Ed took pictures of it for me, and actually drove me out to see it (in the car), once, because our garden isn’t visible from our house. Eventually, I became able to walk outside again, but haven’t been able to do any gardening, other than picking a squash or an occasional pepper. Poor Ed’s had to do all of the gardening alone–the watering, the weeding, and the harvesting. He may need some back therapy of his own, by the end of the summer. Gardening has been a challenge in several other ways, this year, too. At first, the soil was so wet, we couldn’t plant. 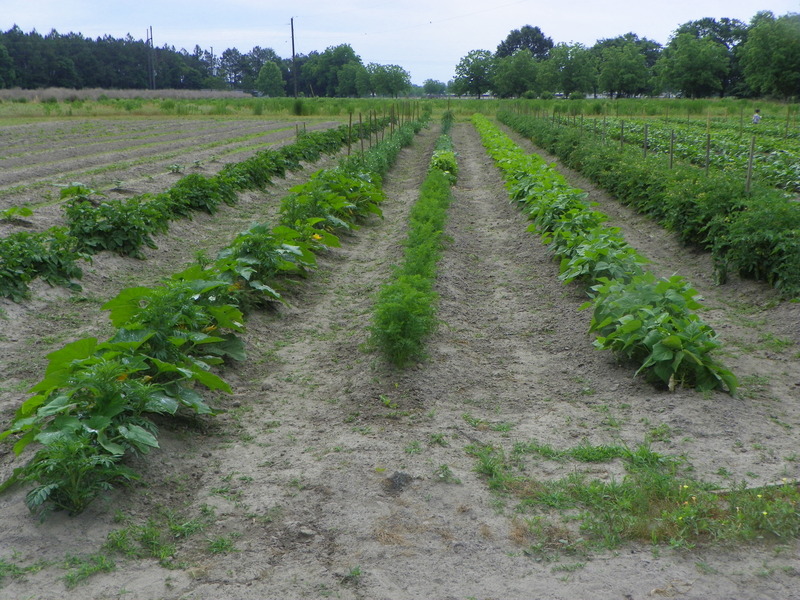 When we finally planted, we experienced a late freeze, and had to cover our plants. We lost all of our cucumber plants, even though we covered them up. Next, came the torrential rains. Our garden stood under water until Ed dug a drainage ditch at the end of it. Once the water eventually receded, it never rained anymore–for real! We’ve barely received an inch of rain in well over five weeks. I don’t know how anything is surviving in that powder house that’s serving as our garden! We’ve been watering daily, for weeks, just to keep things alive, and the plants are surviving, although not thriving. In the meantime, with any luck at all, Ed will be picking a few peas, very soon, and, hopefully, he’ll be able to harvest some fresh corn, too! I hope his back will hold out longer than mine did. As for me? I guess I’m nominated as ‘the garden supervisor’, at least for now. Looking ahead to gardening in 2016? Only time (and the condition of our aging backs) will tell. I guess we’ll just have to wait and see what happens in the coming year. I have a feeling we’ll plant a ‘little something’, just because it just makes us feel good to watch things grow. 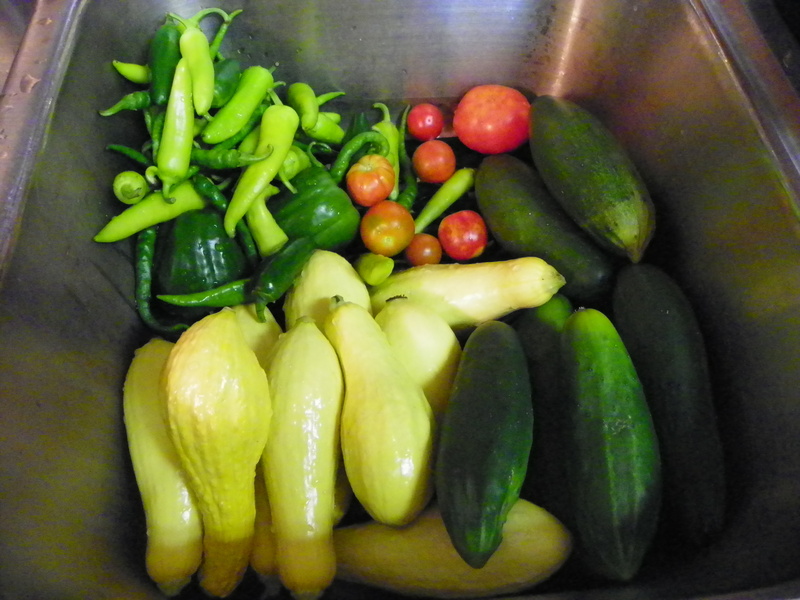 Any fresh vegetables we harvested would just be an added benefit! It’s been another eventful week, but, lately, they always are. I’m so ready to have some ‘normal’, uneventful weeks again. 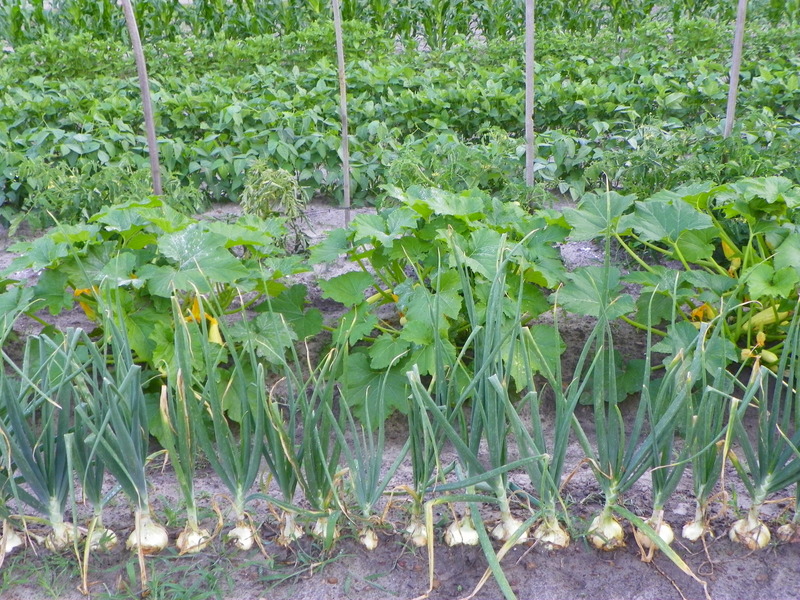 Our garden continues to grow, in spite of the fact that we’ve only received 1/8 of an inch of rainfall in over a month. Ed gets lots of exercise moving the water sprinkler around in the garden. Since our garden is so big, we can’t water everything, so we have to settle for watering the plants that are suffering the most. It’s gut-wrenching watering some and not all. We’re concentrating on our tomatoes, beans, and peas, at the moment. I finally gave in and went to see the doctor about my back, on Monday. He gave me a prescription for prednisone, which seems to be helping with the left leg numbness some. I had an MRI done, on Tuesday, and the ‘official’ report says I have one herniated disc, and one bulging disc. I’ll be seeing a specialist as soon as I get a referral. Speaking of the MRI and a referral… I got a call, yesterday morning, from my gynecologist’s office. Somehow, the report from my MRI had gotten sent to their office! What’s up with that? The PA told me what the report said, then told me I’d need to see a neurologist or an orthopedic surgeon. (She offered to do a referral.) I figured I’d wait and let my primary care physician do the referring, but I haven’t heard from him yet. We went to the hospital where Ed used to work to have my MRI done. It was good to see everybody again, and everyone seemed happy to see Ed again. It’s already been almost 5 months since he last worked there! The hospital seemed quiet and empty compared to the days when Ed first went to work there, eight years ago. They’re operating with a lot less staff, these days. Only time will tell if the hospital can remain open. In other news, our oldest son and his wife bought a new car last weekend, and they drove almost 800 miles (round trip) to buy it! Of course, that trip was nothing compared to the trip they made when purchasing the car our son once found on eBay. They rode a bus all the way from Georgia to Louisiana to buy that one! Our son kept his “eBay car” for many years, but decided to trade it in for the new car they just bought. He’d had it for so long, seeing it go was like losing a member of the family. Our youngest son, and his wife will both be starting new jobs on Monday. They’ll also be trying to pack up and get ready to move out of their house by July 1. I’ll bet they’ll be glad to have some normal, uneventful weeks again, too. That’s about it for this week’s fragments. I’ll be linking mine up at Half-past Kissin’ Time. Have a nice weekend, everyone.